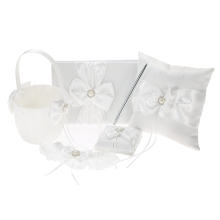 Five necessary wedding supplies: Flower Girl Basket + Ring Bearer Pillow + Guest Book + Pen Holder + Garter. Smooth silk satin face with rhinestones and faux pearls dotted. Beautiful and elegant, perfect for your wedding! Flower Girl Basket + Ring Bearer Pillow + Guest Book + Pen Holder + Bride Garter. Smooth silk satin face with rhinestones and faux pearls dotted. The stretchable garter is a perfect addition to any wedding dress. A ribbon at pillow back for ring bearer to hold it firmly. The guest book offers 72 lined pages to memorize guests&apos; names and wishes. High quality paper and exquisite black ball-point pen.